Heart valve disease occurs if one or more of your heart valves don't work well. 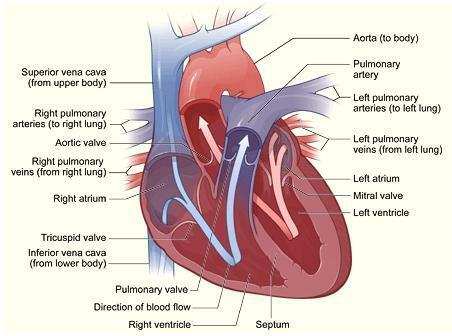 The heart has four valves: the tricuspid, pulmonary, mitral, and aortic valves. At the start of each heartbeat, blood returning from the body and lungs fills the atria (the heart's two upper chambers). The mitral and tricuspid valves are located at the bottom of these chambers. As the blood builds up in the atria, these valves open to allow blood to flow into the ventricles (the heart's two lower chambers). After a brief delay, as the ventricles begin to contract, the mitral and tricuspid valves shut tightly. This prevents blood from flowing back into the atria. At the same time, the aortic valve opens to allow blood to flow from the left ventricle into the aorta. The aorta carries oxygen-rich blood to the body. As the ventricles relax, the pulmonary and aortic valves shut tightly. This prevents blood from flowing back into the ventricles. For more information about how the heart pumps blood and detailed animations, go to the Health Topics How the Heart Works article. Heart valves can have three basic kinds of problems: regurgitation, stenosis, and atresia. Regurgitation, or backflow, occurs if a valve doesn't close tightly. Blood leaks back into the chambers rather than flowing forward through the heart or into an artery. "Prolapse" is when the flaps of the valve flop or bulge back into an upper heart chamber during a heartbeat. Prolapse mainly affects the mitral valve. Stenosis occurs if the flaps of a valve thicken, stiffen, or fuse together. This prevents the heart valve from fully opening. As a result, not enough blood flows through the valve. Some valves can have both stenosis and backflow problems. Some people are born with heart valve disease, while others acquire it later in life. Heart valve disease that develops before birth is called congenital heart valve disease. Congenital heart valve disease can occur alone or with other congenital heart defects. Congenital heart valve disease often involves pulmonary or aortic valves that don't form properly. These valves may not have enough tissue flaps, they may be the wrong size or shape, or they may lack an opening through which blood can flow properly. Acquired heart valve disease usually involves aortic or mitral valves. Although the valves are normal at first, problems develop over time. Many people have heart valve defects or disease but don't have symptoms. For some people, the condition mostly stays the same throughout their lives and doesn't cause any problems. For other people, heart valve disease slowly worsens until symptoms develop. If not treated, advanced heart valve disease can cause heart failure, stroke, blood clots, or death due to sudden cardiac arrest (SCA). Currently, no medicines can cure heart valve disease. However, lifestyle changes and medicines can relieve many of its symptoms and complications. These treatments also can lower your risk of developing a life-threatening condition, such as stroke or SCA. Eventually, you may need to have your faulty heart valve repaired or replaced. Some types of congenital heart valve disease are so severe that the valve is repaired or replaced during infancy, childhood, or even before birth. Other types may not cause problems until middle-age or older, if at all. Heart conditions and other disorders, age-related changes, rheumatic fever, or infections can cause acquired heart valve disease. These factors change the shape or flexibility of once-normal valves. The cause of congenital heart valve disease isn't known. It occurs before birth as the heart is forming. Congenital heart valve disease can occur alone or with other types of congenital heart defects. Damage and scar tissue due to a heart attack or injury to the heart. Advanced high blood pressure and heart failure. These conditions can enlarge the heart or the main arteries. Atherosclerosis in the aorta. Atherosclerosis is a condition in which a waxy substance called plaque builds up inside the arteries. The aorta is the main artery that carries oxygen-rich blood to the body. Men older than 65 and women older than 75 are prone to developing calcium and other types of deposits on their heart valves. These deposits stiffen and thicken the valve flaps and limit blood flow through the valve (stenosis). The aortic valve is especially prone to this problem. The deposits look similar to the plaque deposits seen in people who have atherosclerosis. Some of the same processes may cause both atherosclerosis and heart valve disease. Untreated strep throat or other infections with strep bacteria that progress to rheumatic fever can cause heart valve disease. When the body tries to fight the strep infection, one or more heart valves may be damaged or scarred in the process. The aortic and mitral valves most often are affected. Symptoms of heart valve damage often don't appear until many years after recovery from rheumatic fever. Today, most people who have strep infections are treated with antibiotics before rheumatic fever occurs. If you have strep throat, take all of the antibiotics your doctor prescribes, even if you feel better before the medicine is gone. Heart valve disease caused by rheumatic fever mainly affects older adults who had strep infections before antibiotics were available. It also affects people from developing countries, where rheumatic fever is more common. Common germs that enter the bloodstream and get carried to the heart can sometimes infect the inner surface of the heart, including the heart valves. This rare but serious infection is called infective endocarditis, or IE. The germs can enter the bloodstream through needles, syringes, or other medical devices and through breaks in the skin or gums. Often, the body's defenses fight off the germs and no infection occurs. Sometimes these defenses fail, which leads to IE. IE can develop in people who already have abnormal blood flow through a heart valve as the result of congenital or acquired heart valve disease. The abnormal blood flow causes blood clots to form on the surface of the valve. The blood clots make it easier for germs to attach to and infect the valve. IE can worsen existing heart valve disease. Many other conditions and factors are linked to heart valve disease. However, the role they play in causing heart valve disease often isn't clear. Autoimmune disorders. Autoimmune disorders, such as lupus, can affect the aortic and mitral valves. Carcinoid syndrome. Tumors in the digestive tract that spread to the liver or lymph nodes can affect the tricuspid and pulmonary valves. Metabolic disorders. Relatively uncommon diseases (such as Fabry disease) and other metabolic disorders (such as high blood cholesterol) can affect the heart valves. Diet medicines. The use of fenfluramine and phentermine has sometimes been linked to heart valve problems. These problems typically stabilize or improve after the medicine is stopped. Radiation therapy. Radiation therapy to the chest area can cause heart valve disease. This therapy is used to treat cancer. Heart valve disease due to radiation therapy may not cause symptoms until years after the therapy. Marfan syndrome. Congenital disorders, such as Marfan syndrome and other connective tissue disorders, can affect the heart valves. Older age is a risk factor for heart valve disease. As you age, your heart valves thicken and become stiffer. Also, people are living longer now than in the past. As a result, heart valve disease has become an increasing problem. The main sign of heart valve disease is an unusual heartbeat sound called a heart murmur. Your doctor can hear a heart murmur with a stethoscope. However, many people have heart murmurs without having heart valve disease or any other heart problems. Others may have heart murmurs due to heart valve disease, but have no other signs or symptoms. Heart valve disease often worsens over time, so signs and symptoms may occur years after a heart murmur is first heard. Many people who have heart valve disease don't have any symptoms until they're middle-aged or older. Heart valve disease can cause chest pain that may happen only when you exert yourself. You also may notice a fluttering, racing, or irregular heartbeat. Some types of heart valve disease, such as aortic or mitral valve stenosis, can cause dizziness or fainting. Your primary care doctor may detect a heart murmur or other signs of heart valve disease. However, a cardiologist usually will diagnose the condition. A cardiologist is a doctor who specializes in diagnosing and treating heart problems. To diagnose heart valve disease, your doctor will ask about your signs and symptoms. He or she also will do a physical exam and look at the results from tests and procedures. Your doctor will listen to your heart with a stethoscope. He or she will want to find out whether you have a heart murmur that's likely caused by a heart valve problem. Your doctor also will listen to your lungs as you breathe to check for fluid buildup. He or she will check for swollen ankles and other signs that your body is retaining water. Echocardiography (echo) is the main test for diagnosing heart valve disease. But an EKG (electrocardiogram) or chest x ray commonly is used to reveal certain signs of the condition. If these signs are present, echo usually is done to confirm the diagnosis. Your doctor also may recommend other tests and procedures if you're diagnosed with heart valve disease. For example, you may have cardiac catheterization, stress testing, or cardiac MRI (magnetic resonance imaging). These tests and procedures help your doctor assess how severe your condition is so he or she can plan your treatment. This simple test detects and records the heart's electrical activity. An EKG can detect an irregular heartbeat and signs of a previous heart attack. It also can show whether your heart chambers are enlarged. An EKG usually is done in a doctor's office. This test can show whether certain sections of your heart are enlarged, whether you have fluid in your lungs, or whether calcium deposits are present in your heart. A chest x ray helps your doctor learn which type of valve defect you have, how severe it is, and whether you have any other heart problems. Echo uses sound waves to create a moving picture of your heart as it beats. A device called a transducer is placed on the surface of your chest. The transducer sends sound waves through your chest wall to your heart. Echoes from the sound waves are converted into pictures of your heart on a computer screen. Your doctor may recommend transesophageal echo, or TEE, to get a better image of your heart. During TEE, the transducer is attached to the end of a flexible tube. The tube is guided down your throat and into your esophagus (the passage leading from your mouth to your stomach). From there, your doctor can get detailed pictures of your heart. You'll likely be given medicine to help you relax during this procedure. For this procedure, a long, thin, flexible tube called a catheter is put into a blood vessel in your arm, groin (upper thigh), or neck and threaded to your heart. Your doctor uses x-ray images to guide the catheter. Through the catheter, your doctor does diagnostic tests and imaging that show whether backflow is occurring through a valve and how fully the valve opens. You'll be given medicine to help you relax, but you will be awake during the procedure. Your doctor may recommend cardiac catheterization if your signs and symptoms of heart valve disease aren't in line with your echo results. The procedure also can help your doctor assess whether your symptoms are due to specific valve problems or coronary heart disease. All of this information helps your doctor decide the best way to treat you. During stress testing, you exercise to make your heart work hard and beat fast while heart tests and imaging are done. If you can't exercise, you may be given medicine to raise your heart rate. A stress test can show whether you have signs and symptoms of heart valve disease when your heart is working hard. It can help your doctor assess the severity of your heart valve disease. Cardiac MRI uses a powerful magnet and radio waves to make detailed images of your heart. A cardiac MRI image can confirm information about valve defects or provide more detailed information. This information can help your doctor plan your treatment. An MRI also may be done before heart valve surgery to help your surgeon plan for the surgery. Your doctor may ask you to limit physical activities that make you short of breath and tired. He or she also may ask that you limit competitive athletic activity, even if the activity doesn't leave you unusually short of breath or tired. Treat coronary heart disease (CHD). CHD medicines can reduce your heart's workload and relieve symptoms. If you've had previous heart valve disease and now have a man-made valve, you may be at risk for a heart infection called infective endocarditis (IE). This infection can worsen your heart valve disease. Let your doctors and dentists know if you have a man-made valve or if you've had IE before. They may give you antibiotics before dental procedures (such as dental cleanings) that could allow bacteria to enter your bloodstream. Talk to your doctor about whether you need to take antibiotics before such procedures. Your doctor may recommend repairing or replacing your heart valve(s), even if your heart valve disease isn't causing symptoms. Repairing or replacing a valve can prevent lasting damage to your heart and sudden death. When possible, heart valve repair is preferred over heart valve replacement. Valve repair preserves the strength and function of the heart muscle. People who have valve repair also have a lower risk of IE after the surgery, and they don't need to take blood-thinning medicines for the rest of their lives. Balloon valvuloplasty. Heart valves that don't fully open (stenosis) can be repaired with surgery or with a less invasive catheter procedure called balloon valvuloplasty. This procedure also is called balloon valvotomy. You're awake during the procedure, which usually requires an overnight stay in a hospital. Balloon valvuloplasty doesn't work as well as surgery for adults who have aortic valve stenosis. Biological valves are made from pig, cow, or human heart tissue and may have man-made parts as well. These valves are specially treated, so you won't need medicines to stop your body from rejecting the valve. Man-made valves last longer than biological valves and usually don't have to be replaced. Biological valves usually have to be replaced after about 10 years, although newer ones may last 15 years or longer. If you're a woman of childbearing age or if you're athletic, you may prefer a biological valve so you don't have to take blood-thinning medicines. If you're elderly, you also may prefer a biological valve, as it will likely last for the rest of your life. The Ross operation may be especially useful for children because the surgically replaced valves continue to grow with the child. Also, lifelong treatment with blood-thinning medicines isn't required. Heart valve disease is a lifelong condition. However, many people have heart valve defects or disease but don't have symptoms. For some people, the condition mostly stays the same throughout their lives and doesn't cause any problems. For other people, the condition slowly worsens until symptoms develop. If not treated, advanced heart valve disease can cause heart failure or other life-threatening conditions. Eventually, you may need to have your faulty heart valve(s) repaired or replaced. After repair or replacement, you'll still need certain medicines and regular checkups with your doctor. If you have heart valve disease, see your doctor regularly for checkups and for echocardiography or other tests. This will allow your doctor to check the progress of your heart valve disease. Call your doctor if your symptoms worsen or you have new symptoms. Also, discuss with your doctor whether lifestyle changes might benefit you. Ask him or her which types of physical activity are safe for you. Call your doctor if you have symptoms of infective endocarditis (IE). Symptoms of this heart infection include fever, chills, muscle aches, night sweats, problems breathing, fatigue (tiredness), weakness, red spots on the palms and soles, and swelling of the feet, legs, and belly. Mild or moderate heart valve disease during pregnancy usually can be managed with medicines or bed rest. With proper care, the disease usually won't pose heightened risks to the mother or fetus. Doctors can treat most heart valve conditions with medicines that are safe to take during pregnancy. Your doctor can advise you on which medicines are safe for you. Severe heart valve disease can make pregnancy or labor and delivery risky. If you have severe heart valve disease, consider having your heart valves repaired or replaced before getting pregnant. This treatment also can be done during pregnancy, if needed. However, this surgery poses danger to both the mother and fetus.